Okay so my title is perhaps a little dramatic ?…We shot these pictures a little while ago – you know, around that time when it just wouldn’t stop raining? Yeah, then. There was a weekend when we were going to be in a beautiful location, so even though the forecast was terrible I was determined to get some pictures to do this beautiful cape justice. True to the forecast, it absolutely threw it down and the wind blasted with incredible force. Somewhat defeated, I didn’t look at the pictures for about a month after they had been shot. I guess I was too convinced the rain and wind had messed up all my plans for them, haha! Upon reflection – some of my favourite shots have actually come out of this shoot! Funny how things work out, isn’t it? Often when I try to shoot in these condition I just give in, but I’m glad we persisted! I’m sure many of you reading this will know my pain when it comes to shooting in gross weather conditions – have you ever had any case where it actually turned out really well? 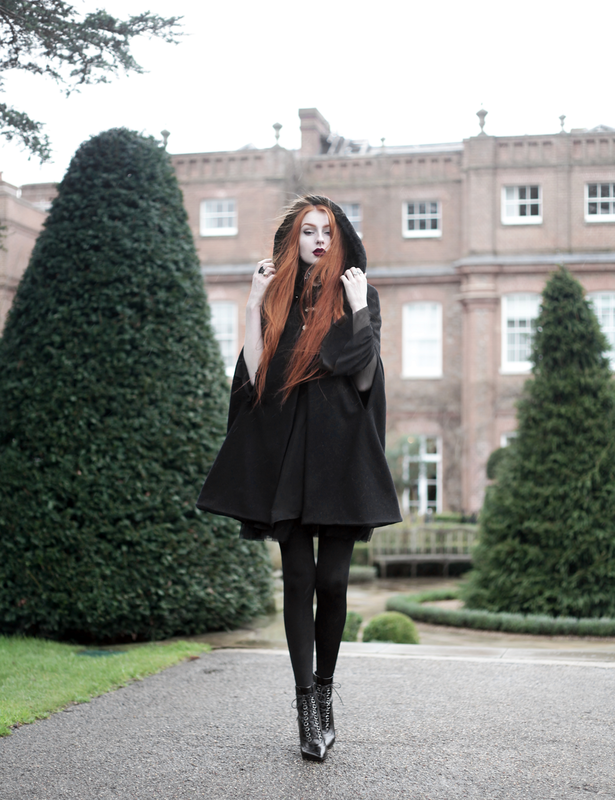 All that said, I’m glad it was this gorgeous Dark Thorn cape that I was shooting that day. It provided an opportunity for the super cosy faux-fur lined hood to actually be used! The whole thing is so wonderfully put together… Yes, I know I’ve prattled on about how beautiful their pieces are previously (here), but it is honestly not without cause. I work with luxury goods on a daily basis at my job, and it is rare(-r than it should be) that I see craftsmanship with the love and attention to detail that Tori-Anne pours into her garments. And for a brand that she started four years ago at the age of 18… I think that’s pretty damn incredible! Anyway – thank you so much once again for listening to my ramblings! In this post I’ve tried to mix the format up a bit so the text is interspersed between images. Does that work for you guys? I have been worrying about my posts looking too mush like a wall of text, so I hope this makes it a bit more digestable when reading? Next Post Vintage Cat Tee & Fishnet. this cape is indeed wonderful! In love with this whole outfit, you look incredible! Oh wow that cape is beautiful!